Soon I'll be leaving for Ghana again, where I will be working for a newspaper for four weeks. Much like last year, my internet will range somewhere on a scale of Eddy Curry (absolutely disgraceful) to Gerald Henderson (totally mediocre), leaning more towards the former. Occasionally there may be moments of my internet connection being comparable to Bruno Caboclo (perfect in every way) but those will be fleeting. Anyway, that means that I'll be away from this site, and from the American sports scene for a bit, but have no fear. I'll try to write something if I can during my time away (no word yet on when it will actually be posted. That's always an adventure, as evidenced by this article) and upon my return I'll be bringing back my 32 in 32 series, where I preview each NFL team leading up to the season opener. I will have significantly less than 32 days to complete it, but I'll double up on some days in order to get it done. Let's go Mets. 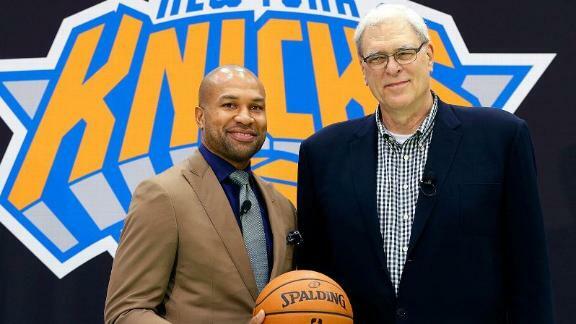 Let's go Phil Jackson. France- After an absolutely disastrous 2010 campaign, the French team has solved all the turmoil and turned things around. Coach Didier Deschamps took over two years ago and attempted to change the culture by refusing to select any players who could potentially cause problems. Even without their best player, Franck Ribéry, the French side is playing extremely fell thanks to great defense and an unstoppable attack led by Karim Benzema's 4 goals. The land mass and people of Brazil- Had Brazil scuffled at all during the group stage and found a way, as impossible as it seems, to get eliminated prior to the knockout stage, I would have worried for the safety of the entire country of Brazil. They made it through. The world is still spinning, for now. The first time that I heard of a tandem rotation was when I was listening to the now dead Baseball Today podcast on ESPN, which they need to bring back immediately. Anyway, they brought up that the Rockies were beginning to employ this strategy of a tandem, or piggyback rotation. What that means is, instead of having a traditional five-man rotation, teams would have an eight-man rotation, with two pitchers scheduled to pitch on a given day, and instead of having four days in between outings, pitchers would have three days to recover. The philosophy behind it is to lower the risk of an arm injury for a pitcher by decreasing the innings and pitch count. The Houston Astros use it in all levels of their minor league system not only to protect their young arms, but to help evaluate more pitchers that with a normal rotation. They have legitimate data on eight guys at a time rather than five pitchers with a much smaller sample size for the other three out of the bullpen. Another important factor is that most pitchers are better the first time through the order than the second and third times through. This method saves pitchers from blowing up as a result of going too far into a start, allowing the opposing hitters to adjust to him. Now, how exactly does this happen? 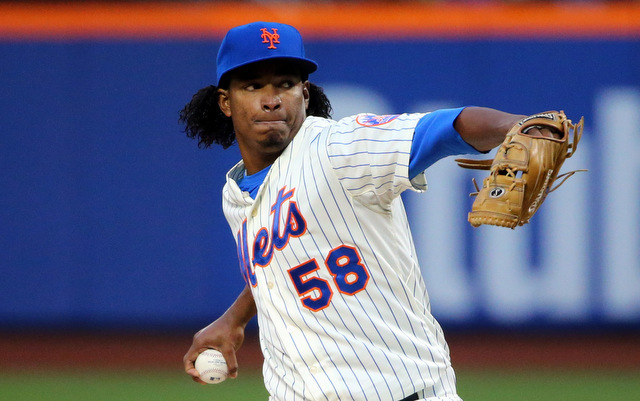 The first pitcher would be scheduled for about 4 innings and 75 pitches, at which point the second "starter" would come in to relieve him., with the same pitch and inning restrictions before handing it off to the bullpen if necessary. This is the third straight year that I've done a live blog for an elimination game in the NBA Finals, and I've had great results so far. First, I was writing my reactions as the Big 3 won their first title by closing out the Oklahoma City Thunder in Game 5 two years ago. Then, last year, after live blogging all day about a Mets doubleheader that started with Matt Harvey and led into the debut of Zack Wheeler, I live blogged the amazing Game 6 of the Finals. Refresh the page for updates. First of all, Erik Spoelstra replaced Mario Chalmers in the lineup with Ray Allen. Shalmers has been absolutely useless so far in the series, so it's good that he's been relegated to the bench. This confirms my thinking that LeBron James will be in control of the ball for most of the night. 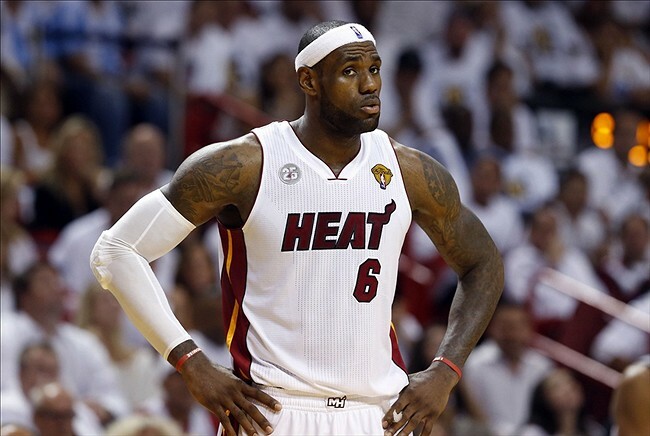 I will be writing a live blog during tonight's Game 5 as I watch what I think will be a fairly dominant Heat victory. I simply don't see the Heat allowing themselves to go down so easily, especially after being embarrassed in the last two games at home. As I said yesterday, there's still a very good chance that the Spurs will win the series with their next opportunity in Game 6. Dwyane Wade has looked awful in this series. His total lack of defensive effort along with his overall poor offense has been one of the many factors in his team's struggles to this point. He looks tired and unhealthy. I don't know if that's simply him breaking down or something else that's happening. Either way, I expect to see him give everything he has tonight, as he supports LeBron James, and those two break down San Antonio's defense. James will have the ball in his hands all night, playing the point. He'll be aggressive from the beginning in terms of scoring. One thing to watch out for is his confidence in his jump shot early. The Spurs will of course be giving him the perimeter from the opening tip. He'll challenge that strategy. If he's knocking down shots with regularity, he's going to have an amazing game, and can score as many as 60 points. That doesn't mean that he'll continue to settle as the game goes along. Once he knows he has his shooting ability to use as a weapon all night, he'll be aggressive in driving to the hoop, not only to score, but to draw fouls and open up the perimeter for others. That's where Wade comes in. In recent years, he's been one of the best players in the NBA off the ball, as his constant cuts to open space lead to most of his points. There will be a lot of that tonight. Also look out for Chris Bosh, as his ability to knock down the open mid range shot tonight will be a key. Don't think I'm forgetting the Spurs here. While I'm not predicting them to win, there's obviously still a chance that they close it out. Once again their role players will attempt to take over the game from the beginning offensively, and if they are able to do so, the Spurs will be celebrating with the Larry O'Brien trophy tonight. But LeBron James won't let it happen. At least, not yet. Look for the live blog throughout the game. The NBA Finals took quite the turn last night, and while I wasn't expecting it, I wasn't shocked at all. The Spurs have the ability to take over a game with their beautiful offense, it's just hard to believe that the Heat allowed it to happen two games in a row. I was wrong. I thought the Heat would come out with some fire and defend the Spurs well, but that simply didn't happen. 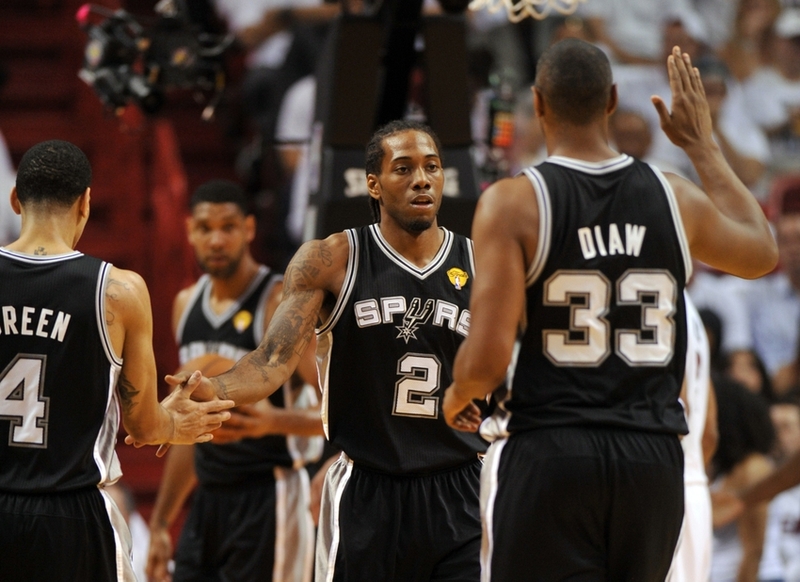 The Spurs' success was less predicated on luck this time around, but pure skill. Much like Game 3, their ball movement was impeccable, and despite shooting a lower percentage, were still dominating Miami. Led by Boris Diaw's 9 assists, to go along with 8 points and 9 rebounds, because he's Boris Diaw and he can do such things, San Antonio was whipping the ball around every possession, looking for the best shot opportunity available. And the Heat simply didn't have an answer for them. Despite not turning the ball over a ridiculous amount, Miami came away with many empty possessions in the first half. From that point, LeBron James tried to take over in the third quarter, scoring 19 of his team's 21, making 7 of 8 field goals, but he was getting no help. It was really hard to watch him put his team on his back and despite playing on a rather loaded team, trucked on as everyone else disappeared. Part of that was because of very good defense by San Antonio. And some of that was lazy off ball offense and poor shooting by the Heat who went 1 for 9 from the field other than James in that quarter. It will be interesting to see how this series ends, which I'll cover more tomorrow when we have an extra day off between games. For now, I must watch double overtime of Game 5 of the Stanley Cup. I can barely breathe while writing this. Game 4 is tonight, and the Heat will be looking to even it up before heading back to San Antonio to continue the series. Otherwise, they'll be looking at elimination in Game 5. I expect the Heat to do just that, as the combination of San Antonio's offensive luck running out to a certain extent, and some adjustments will allow them to split these home games. As I mentioned yesterday, the reason why the Spurs won Game 3 was because they were hitting shots. Some of those shots will still go in tonight, but some of them will rim out. That way, they won't be able to blow the game open from the beginning. Expect to see them employ the same strategy of having their role players be aggressive at the start. But the law of averages, plus an extra defensive effort by the Heat will deny them. there will be a lot of hard switches on the pick and roll, and the Heat will be closing out harder. They'll do everything to make sure that the Spurs will earn every point in this game. They will also make a concerted effort to take care of the ball on offense. Despite having a hard time keeping the turnovers down in Game 3, LeBron James should be dominating the ball even more tonight. That's mostly because it's hard to trust Mario Chalmers at this moment, and Norris Cole hasn't been much better. 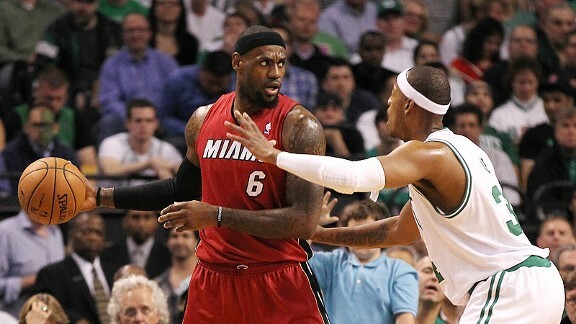 Look for those changes, and a very good performance from LeBron James, leading to a Miami victory. If they lose, they're in serious trouble. I was unable to watch last night's game live, but I caught a replay of it this afternoon on NBA TV's NBA Playoff Playback. I was totally blindsided by the blowout. I never would have predicted that there would be a blowout in this series, especially not so early on. But, looking back, it makes sense to me how this happened. The Spurs simply kept hitting shots. There was absolutely nothing the Heat could do to stop them. Sometimes teams have games in which they hit everything, and they also have games where they miss everything. Sometimes you're Henrik Lundqvist (normal Lundqvist, not what he's currently doing. Let's not talk about it.) and sometimes you're Rick DiPietro. Sometimes you're Ted Williams and sometimes you're 2014 Derek Jeter (too soon?). Usually performances lie somewhere in the middle. The great players and teams normally play closer to that highest level than everyone else, which is why they are considered great. But even for the best, they can still get better. That's what happened last night. The Spurs moved the ball very well, playing perfect Spurs basketball. That was exactly the way anyone would expect to see a Gregg Popovich team play. And that offense was leading to buckets. Scoring 41 points in the first quarter, led by 16 from Kawhi Leonard, who I will get back to later, the Spurs made a statement from the very beginning. They shot a blazing 86.7% from the field in that quarter. They were simply, unstoppable. They were aggressive and looking for open shots. While they cooled off a bit from there, they still ended the first half shooting 75.8% for the game. The best part is that they largely did it without relying on the Big 3. Tony Parker didn't score in the first quarter, while Manu Ginobili added two field goals and Tim Duncan went into the second with only one made basket. Tiago Splitter was looking to score moreso than usual after being replaced in the starting lineup by Boris Diaw. Danny Green went 7 of 8 from the floor, but only one of those made shots were from behind the three point line. He was putting the ball on the floor a lot more often and even attacking the basket. It will be interesting to see if he keeps on with that strategy from now on. The Heat played a bad game by their standards, but they were by no means awful. LeBron James had 7 turnovers, which is pretty unusual for him, but while watching it I didn't feel like they were playing horribly. Certainly some of the turnovers were bad, but it just felt like things were piling on the Heat. Normally they'd have a chance to make up for mistakes, but not when San Antonio is shooting the lights out. Now it's time to circle back to Kawhi Leonard. I absolutely love him, and last night was the best game of his career. He came out looking to score, which is not what he usually does. 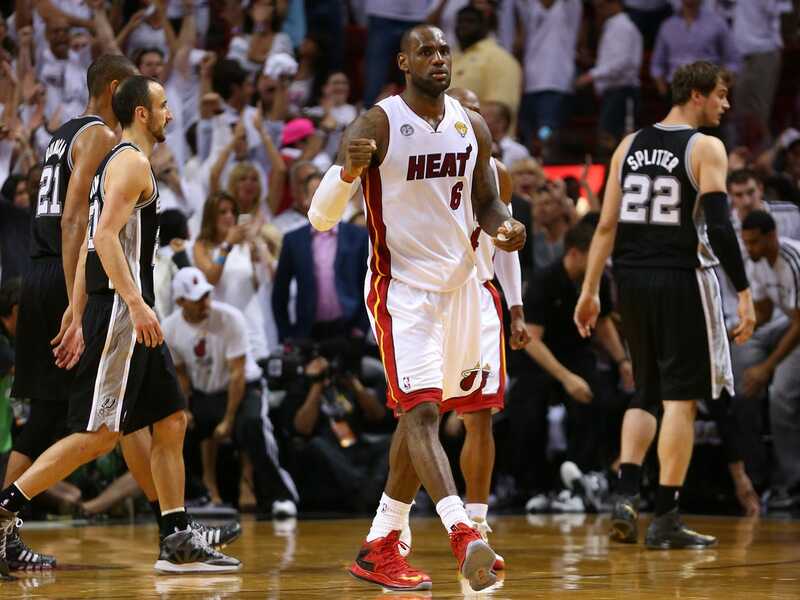 He took over from the beginning, and LeBron James and the Heat didn't have an answer for his hot shooting. I really hope he continues to play like this not only for the rest of the series, but into next season. I've said it before, but he's very capable of being a great player with the right mentality. Maybe my prediction for him to make an All-NBA team was a year early? Tonight, the series shifts to Miami for the next two games after Miami came away with a split in San Antonio with their Game 2 victory. I except the same result from these next two games, a split. The teams are too evenly matched for anyone to come away with a clear advantage just yet. As for tonight, I think the Spurs should be able to bounce back, despite being on the road. It has always been said that role players play worse away from home, which tends to actually be true sometimes, but that won't really affect this game much. That's usually the case with more erratic players, such as spot up shooters who can change the game with their streaky shooting, but don't have much use otherwise. So, it could take someone like Marco Bellinelli out of the game, but the rest of the Spurs are too solid. We all know about Danny Green's ability to shoot, but it's actually his talented defense on the wing that makes him an important player for the Spurs, as they have a lot of offensive talent. Boris Diaw will still grab rebounds and make beautiful passes, unaffected by the crowd. The real key in this game will be the effectiveness of Manu Ginobili. He has used the strategy before, but Erik Spoelstra uncovered a gem in Game 2 when LeBron James was guarding Tony Parker, causing the Spurs offense to stagnate. I expect to see him use that matchup to his advantage earlier in the fourth quarter. This means that in response, Gregg Popovich will be allowing Manu Ginobili to be the focus of the pick and roll. Whether he's being guarded by Dwyane Wade or Ray Allen, he should have a relatively easy time getting open with screens being set by either Tim Duncan or Diaw, and on some plays, even both of them. I forsee Ginobili taking over down the stretch, thriving in his role as the main facilitator. There's some double-double potential, or at least, as much as there can be for any Spur considering how much they spread the ball around to everyone. This isn't a knock on the Heat at all. We'll see a very close and competitive game all the way through, but when two teams are so close in every category, one tiny coaching adjustment can decide a game. Check back tomorrow as I recap tonight's game and talk about how wrong my prediction ended up being. I really should have written this article before, because as I write, Game 3 of the Stanley Cup begins in six minutes. So I guess I'll finish this off during the intermissions. Oops. As for the other championship series currently in progress, the Heat evened it up last night, as I predicted. LeBron James didn't play just how I expected him to, but he still took over the game after a lackluster first quarter. He was confidently taking the jumpers that the Spurs were letting him take. That strategy can work against him sometimes, but last night was not one of those moments. Kawhi Leonard was doing an okay job of defending James, but that won't be good enough if LeBron continues to drill shots from outside. As we saw, Leonard got himself into foul trouble, before finally fouling out of the game entirely by the end. Before James took over offensively, both sides played efficient offense. The ball was moving very well, and they were getting decent looks most times down the floor. To counteract that, both teams were also playing great defense. In the second half, and mostly the fourth quarter, the combination of the improved Miami defense, along with the lack of ball movement on the part of the Spurs led to their downfall. One of the biggest takeaways from this game was at the end, when James was guarding Tony Parker, which completely stagnated San Antonio's offense. They need to run the offense through Ginobili or Diaw if James is guarding their normal point guard, which is an adjustment I expect Popovich to make in time for Game 3. LeBron takes Parker out of the game, and forces him to be indecisive, and simply stand and dribble rather than run a play. A few random notes on this game before we part for the day. First of all, James Jones found his way onto the court again, except as a player this time, not just a guy to carry LeBron off the court. Also, Pop's post-third quarter interview with Doris Burke was him at his absolute best. He was so incredibly uncooperative, it was incredible to watch, as it always is. Finally, my mom noticed Manu Ginobili's nose and claimed that it "has a mind of it's own." Wait, so what do I do now? There was no game last night, and there's no game tonight, so I have nothing to preview nor recap. Oh, but there is in fact something to talk about. While I could certainly go on about the fact that my Rangers are going to bounce back and take Game 2 of the Stanley Cup Finals tonight, this isn't exactly the place for that story. My topic stands at 6 foot 8, weighs 215 pounds, and is one of the weirdest players in the league. And he's also one of the most exciting. Yes, ladies and gentlemen, Boris Diaw. Yes, the man who was shunned by the Bobcats for being fat is now a key player in a championship series, and is about to have a whole article written by me, praising him and only him. The latter honor is the more important one, as he'll join the ranks of legends such as Zack Wheeler, Mike Trout, Matt Harvey, Matt Harvey, Grady Sizemore, who essentially was my entire MLB Preview, Matt Harvey, Dwight Howard, Kostas Papanikolau, James Harden, Mike Trout again, (say it with me...) Matt Harvey, Mack Wheelvey, and Geno Smith; an article which turned out to be six times more popular than everything I've ever written, thanks to it becoming popular in Ukraine, which sounds like a really bad joke. But it's not. I began this series in 2012, and caused myself to commit something that I didn't realize would be so hard for the next two years. See, because the 2011-12 NBA season was shortened due to the lockout, the Finals began on a Tuesday, the day after my last final exam. As I found out last year, in a normal season, the championship actually begins right smack in the middle of my finals week, which means I had an awful experience trying to study and write an article everyday. As a high school junior, I really shouldn't be doing this right now. But hey, I dug my own grave here. Let's get on with it. First of all, this seems eerily similar to last year's series, as it has been exactly 365 days since the 2013 Finals began. Once again it features the San Antonio Spurs and the Miami Heat representing their respective conferences, and the outcome of the series will the legacies and futures of the players involved, moreso than a normal championship series would. As was the case last year, the Heat are coming off closing out a series against the Indiana Pacers at home to advance to the Finals. Oh, and one of the teams is a #1 seed, while the other is a #2 seed, which was also true in 2013.